Your knee ligaments help to keep your knee stable. The medial collateral ligament (MCL) and lateral collateral ligaments (LCL) are found on either side of your knee joint, and act to limit the amount it can move from side to side. You can sprain or tear your medial collateral ligament if you twist your leg while it's straightened, for example, when being tackled in rugby. Your lateral collateral ligament isn’t usually damaged on its own, but you may need to have it repaired if you have damaged other ligaments. 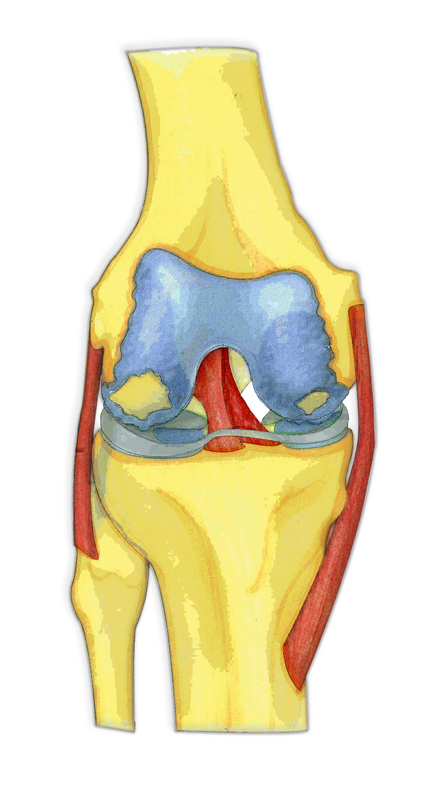 Your anterior cruciate ligament (ACL) and posterior cruciate ligament (PCL) form a cross (cruciate) inside your knee. They help to keep your knee stable when the joint is moving backwards and forwards. Anterior cruciate ligament injuries are one of the most serious types of knee injury. If you have injured your medial collateral (MCL) or lateral collateral ligaments (LCL) this could range from a stretching of the ligament (termed Grade 1) to a partial tear (Grade 2) through to a complete tear (Grade 3). Apart from ligaments there are other soft tissues around your knee that can be injured. Soft tissue means any tissue in your body that isn't bone. You may tear the meniscus in your knee. You can damage it if you play a sport that involves twisting your upper leg while your foot is planted on the floor. As you get older, your meniscus may become slightly thinner or have micro tears (degenerates). This makes it more likely to tear after a very minor injury. If you use your knee a lot, for example if you run, you can irritate or tear the tendon that connects your kneecap (patella) to your thigh muscle. This tendon is called the patella tendon and the condition is patella tendonitis. You may feel or hear a popping or snapping sensation at the time of the injury. You may also find that you can't stand properly on the affected leg, or put your full weight on it. You may feel a tearing sensation and severe pain if you injure the meniscus in your knee. Pain may develop towards the inside, outside or back of your knee joint (depending on which menisus you injured) and you may see some swelling. If you have any of these symptoms, a specialist knee consultant is best placed to advise on the exact diagnosis and options for treatment. Your consultant will ask about your symptoms and examine you. This may include feeling for fluid in your knee joint by pressing gently around your kneecap. He will also ask you to describe how your injury happened, where your pain is and what type of pain it is. You may be asked to walk, sit or lie down so he can test for injury to your knee ligaments or soft tissues. He will bend and flex your knee and move your leg into different positions. You may also be asked to step, squat or hop. You may be referred for diagnostic testing, which can include x-rays, MRI, CT or ultrasound. There are different types of treatment that your consultant may suggest, depending on the type and severity of the damage to your knee. It’s important to be patient when recovering from a knee injury. Your injury may take time to fully repair itself, so you may not be able to do all the things you are used to doing for some time. This is explained in individual treatment rehabilitation and will be explained in detail by your consultant and physiotherapist. You should follow the PRICE procedure to manage any type of soft tissue injury to your knee. PRICE stands for the following. Protection. Protect your injury from further harm. Rest. Rest the injury for the first two to three days, then reintroduce movement so you don't lose too much muscle strength. Ice. Apply a cold compress such as ice or a bag of frozen peas wrapped in a towel to help reduce swelling and bruising. Do this for 15 to 20 minutes every two to three hours. Don't apply ice directly to your skin as it can damage your skin. Compression. Compress the joint by bandaging it to support the injury and help decrease swelling. Don’t leave this on while you sleep. Elevation. Elevate your knee by resting it above the level of your heart and keeping it supported. Heat. This includes having a hot bath or using a heat pack. Alcohol. Drinking alcohol can increase bleeding and swelling in the affected area. Massaging the injured knee. This can cause more swelling or bleeding. You can buy over-the-counter painkillers such as paracetamol to treat mild and moderate pain. Over-the-counter non-steroidal anti-inflammatory drugs (NSAIDs) such as ibuprofen and ketoprofen can help to reduce inflammation and swelling, as well as relieve pain. NSAIDs are available as gels, creams and sprays that you can put directly onto your skin and gently massage in, as well as tablets or capsules that you take by mouth. Your GP may prescribe stronger painkillers if your pain is severe. Always read the patient information that comes with your medicine and if you have questions, ask your pharmacist or doctor for advice. If your injury is more severe or complex, your doctor may refer you a consultant orthopaedic surgeon or for more mild cases of injury, a physiotherapist. He or she will develop a programme of rehabilitation exercises to gradually strengthen your knee and stretch your muscles. These exercises will vary depending on the type of injury you have and how severe it is. Your physiotherapist may also use various techniques to help speed up the healing of your knee. For some types of knee injury, your GP / doctor or physiotherapist may recommend that you have surgery to repair the injury to your knee – especially if other forms of treatment haven’t worked. Your doctor will refer you to an orthopaedic consultant for assessment. You have torn your anterior cruciate ligament (ACL) and you do a lot of sport or have also torn the meniscus or your medial collateral ligament. Anterior cruciate ligament reconstruction involves taking a piece of tendon (usually from your hamstring) to replace the damaged ligament. Your knee remains painful or locks after an injury to your meniscus. Rarely, surgery may involve opening up your knee joint to repair it, or you may be able to have a type of keyhole surgery called knee arthroscopy to access the damaged area of your knee. There are some precautions you can take to try to reduce the risk of damaging your knee ligaments. Spend 5 to 10 minutes warming up before exercise to increase blood flow to your muscles and reduce the chance of an injury. Many sports professionals advise stretching your muscles after warming up and again after cooling down; however, the benefit of stretching before or after exercise to prevent soft tissue injuries is unproven.